Favorite Fall Foods – that’s a mouthful!!! (ha, ha!!) But, really, this new Friday feature is all about Fall comfort food and these are some of my go-to favorites for our family. Nothing difficult in these recipes, just good old-fashioned cooking. 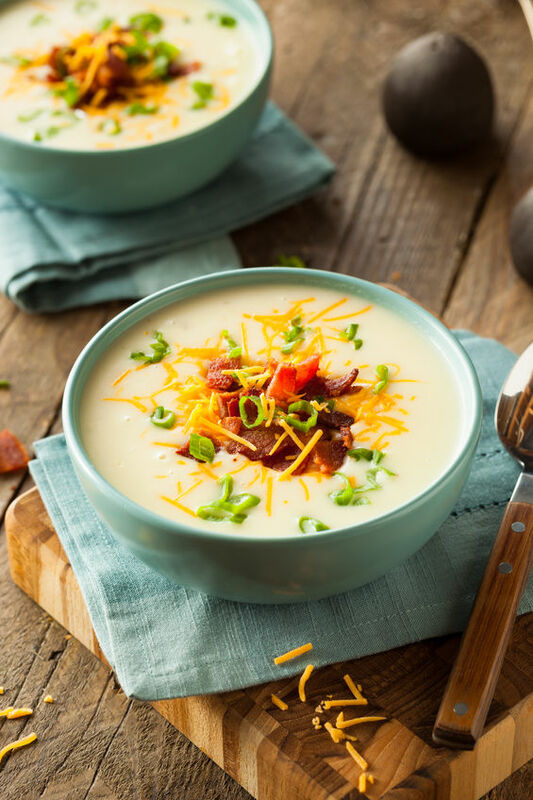 For my first entry, I decided to share one of my husband’s favorites – Baked Potato Soup. I found this recipe from a local recipe book. 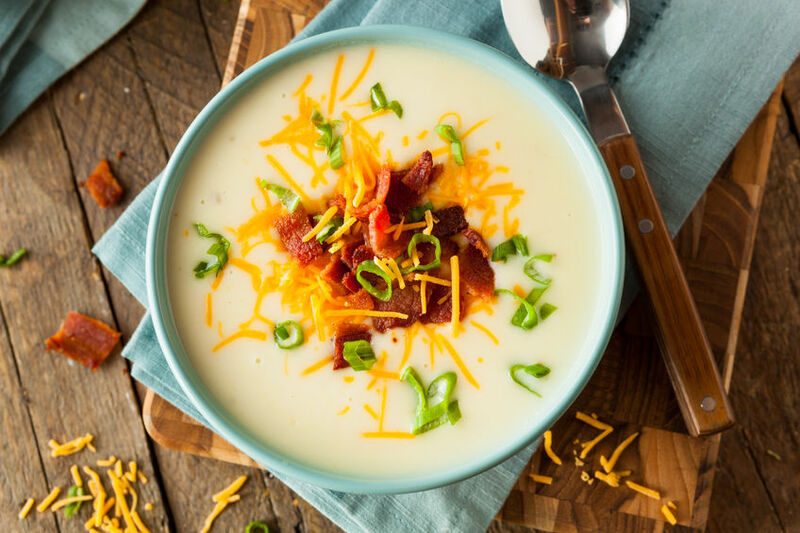 This potato soup is thick, creamy, and delicious! Perfection on a crisp fall day! Garnished with spring onion, shredded cheddar cheese, and crumbled bacon – what could be better on a crisp Fall day! Yum!!! Bake potatoes in oven at 400 degrees until tender. Cool completely. (if it’s cold outside, I sometimes speed up the process by putting the tray on the porch). 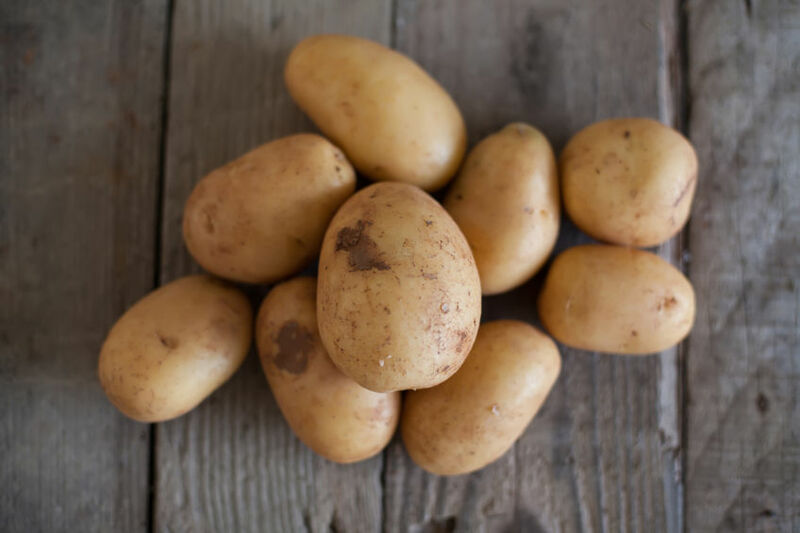 Remove skin and cut potatoes into 1/2 inch cubes. Set aside. Melt butter in large pot. Add onion powder and whisk. Add flour to the butter and whisk until the flour is absorbed. Add the chicken broth, water, potato flakes, dried basil, Tabasco sauce, heavy cream, and milk – whisk as you add these ingredients. Bring to a simmer and continue a gentle simmer for 15 minutes until thick. Add the baked potato cubes and stir to combine. Top each serving with shredded cheddar cheese, spring onions, and bacon pieces as desired. This hearty soup is also great to take to a pot luck or picnic in a crock pot. I hope you have a relaxing Fall weekend and maybe enjoy a bowl of soup! This looks and sounds super yummy! Tanks for the recipe! Thanks, Lisa! I hope you give it a try! Looks yummy! i just made potato/broccoli cheddar soup yesterday using stock we made in the crockpot. So comfy on a rainy day. Ill have to add this one to my soup list! Yes, soup is the BEST on a cold and rainy day! Have a great weekend! Thanks for this recipe! I will surely try it.